The metal sign reads Abbey Road above the door. 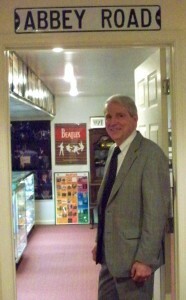 It is the gateway to Ruxton resident Frank Lidinsky’s collection of Beatles memorabilia. The 20- by 12-foot room harbors thousands of items he has organized in chronological order, including every 45 and album that John, Paul, George and Ringo ever made. Lidinsky has been a Beatles fan since he was 13 years old. The Beatles, according to Lidinsky, were for screaming girls. September 13, 1964 was a Sunday and it rained. But Lidinsky remembered, “It was an exciting day to be a teenager in Baltimore.” The Beatles weren’t the only celebrities in town. The News American’s I Am An American Day Parade’s grand marshal was David McCallum, who played Illya Kuryakin on the television show The Man from U.N.C.L.E. The parade was rained out and Lidinsky met McCallum in the War Memorial Building before he headed to the Civic Center to hear the Beatles. “I knew my ticket stub for the Civic Center was going to be valuable,” Lidinsky said, pointing to it, stuck in the corner of a framed black and white photograph of the Civic Center. Taken on September, 13, 1964, the picture shows crowds crossing West Baltimore Street toward the Civic Center. The word “Beatles” is displayed on the center’s sign. Lidinsky added that collectors like to trump each other and he wins every time he mentions his ticket stub. Lidinsky has “always remained loyal to the Beatles.” When others lost interest, he accepted their Beatle’s stuff. 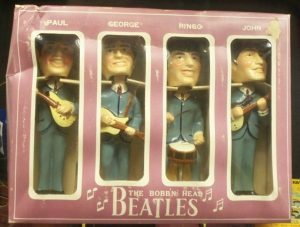 In Lidinsky’s three display cases are Beatles dolls, lunch boxes, buttons, mugs, cuff links, puzzles, even a light blue beanie baby with an insignia that says Sgt. Pepper’s Lonely Hearts Club Band. Lidinsky had his photo taken when he crossed Abbey Road and he displays it along with the check for 75 cents he received from the Beatles fan club when it folded. “I was a member from its inception in 1964 to its end in 1972,” he said. The walls are covered with publicity photos, posters, a valuable autograph of each of the Beatles, authenticated by Fraser’s of London, and every Beatles 45. 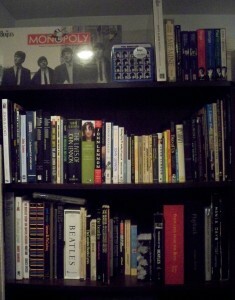 “Listen to Ringo,” he said, adding that he often sits in his Beatles room and listens to their music. “Ringo sings off key at the end of ‘With a Little Help from My Friends’.” Indeed, the voice is clearly Ringo’s and he does miss the notes.